If you’re a regular at the Surgery, you will recall the Good Doctor’s first meeting with Aki Kumar in 2007 during a Jason Ricci gig in San Francisco’s Biscuit & Blues Club. It was world renowned harp pedagogue, author and music impresario Dave Barrett who had kindly put Aki and the Doc in touch. Since then Aki has become very good friends with everyone down by the duck pond. So much so that Aki, his good lady and his esteemed guitar partner Little Jonny Lawton came to visit the Surgery in 2013. Everyone had a blast, not least because Dave Ferguson was also staying over. Aki, Jonny and Dave shared a whopping Saturday night gig; on the bill too were Gordon Russell (of Dr.Feelgood fame) and Brighton’s Blues Deluxe. As the Morris Dancers jigged outside The Tickled Trout Pub, Monty, the Surgery’s loveable pooch cocked his leg up the fiddler’s chair. Aki and the Doc nursed a large jug of Pimm’s, while soaking up the English summer sunshine and devouring scones, strawberry jam and Cornish clotted cream. From under the Harvey’s parasol, the Doc asked Aki a few probing questions.. Growing up in Mumbai (India), how on earth did you get into the harmonica ? 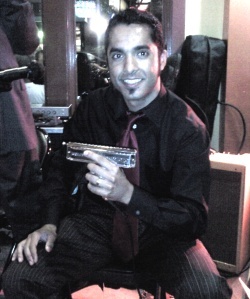 As a teenager, I tried my luck at playing Bollywood tunes with a Chinese tremolo harmonica we had lying around at home. But I soon quit after running into the “missing note” problem. 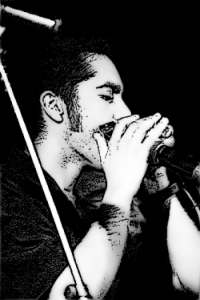 I figured that the harmonica was an inherently limited instrument and gave up on it. Back then, in India, diatonic harmonicas were practically non-existent and bending was unheard of. After I moved out to the USA many years later however, I fell in love with Chicago blues and it revived my interest in the harmonica. A few Internet searches later, I learned about how you could hit certain missing notes by bending reeds and my life has never been the same! But how did you get so ridiculously good so soon? First off, I think I’m just “ok” and I’m constantly trying to get better. It’s tough to get a big head when you have the likes of Gary Smith, Dave Barrett, Rick Estrin, Mark Hummel within an hour’s driving distance of you. I had the good fortune of finding a great teacher – David Barrett – right in my neighborhood. That was around 2004. Mr. Barrett set me straight on a lot of technical aspects of the blues harp and introduced me to the music of great Chicago blues players such as Little Walter, Big Walter and George Smith. I was pretty diligent about practising when I took lessons from him and maybe that helped. A little bird told me you’ve just turned professional. You’ve actually given up the day job! What were you involved with previously? I’m a software engineer by trade but blues has been a very serious passion for the last decade. Growing up in India, I had no exposure to blues, although I was somewhat musically inclined. I received instruction in traditional Hindustani music between the ages of 9-11 and I believe it served me well when I took up music seriously later in life. Now I’ve been to one or two of your infamous jam sessions in San Jose, although you’ve recently moved to Little Lou’s BBQ. And you’ve hosted everyone from Rick Estrin to Anson Funderburgh. You’ve even got Kim Wilson on the waiting list. How did this all happen? Ah yes. The jam sessions! Well, I’ve been hosting a weekly Thursday night blues jam here in San Jose for about 4 years. This jam has taken on a life of its own in the last couple of years and attracts some of the top Bay Area talent regularly. 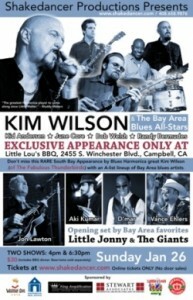 In addition, I invite some of the very best local (and touring) artists to perform at the jam as “featured guests” (including SF Bay Area harp greats – Rick Estrin, Mark Hummel, Gary Smith, Andy Santana, Andy Just, David Barrett). The jam has been a truly fulfilling experience for me because it brings together a large community of blues lovers and musicians for a very exciting night of music-making and appreciation. Talking of Gary Smith and Andy Santana, these are two West Coast harp slingers we don’t know much about in the UK and Europe. But I do remember a balmy January evening at San Jose’s Poor House Bistro a couple of years ago. You guys played a trio version of Gary’s Rocket Ride and we were blown away..
Coming back to your current jam sessions, the rhythm section of your previous band, the fabulous Tip Of The Top, are still involved; especially Carlos Velasco on drums..
Carlos and Frank show their faces on a regular basis! We’re still very good friends, although I don’t have a band these days as much as I have a ‘core’ set of musicians I collaborate with. 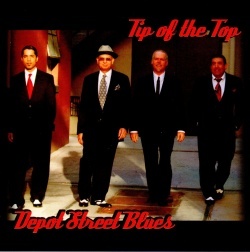 At the top of that list is guitarist Jon Lawton (or Little Jonny, as he’s known in the blues world). Little Jonny was the guitarist in Tip of the Top of course, and we have continued our musical partnership ever since. One of the benefits of living in the SF Bay Area is that there is plenty of superb blues talent available on pretty much every instrument. Some of the esteemed artists I perform with on a regular basis include guitarists – Kid Andersen, Steve Freund, Johnny Cat Soubrand, Rusty Zinn, Bob Welsh, bassists – Vance Ehlers, Kedar Roy, Mike Phillips, drummers – June Core, Derrick Martin, pianist – Sid Morris and more. 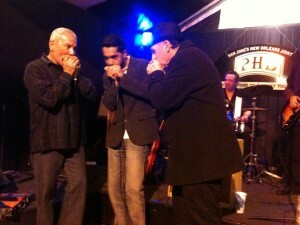 For my blues jam, my house band consists of Eric Selenger (guitar), Carlos Velasco (drums) and Ray Figueroa (bass). They are excellent musicians and stellar personalities, making them the perfect guys to have in the house band at a jam. I can only imagine you must get into all kind of mischief working with characters as big as these? Absolutely. Just a couple of days ago during a recording session for my new album at Kid Andersen’s Greaseland studios, halfway through the session, I started experiencing unexpected and annoying feedback from my amp and so I decided to halt the session while I sorted out the issue. As I was hunched over the amp, desperately tweaking knobs, trying to eliminate the feedback gremlins, I noticed that everyone in the band was chuckling at my dilemma. As it turns out, drummer June Core possesses an expert ability to “whistle” harp feedback sounds (no joke!) and he was the source of the mystery feedback. He got me REAL good! It’s a trick he learned over many, many years of backing up such harp greats such as Mark Hummel, Rick Estrin and Charlie Musselwhite. We know the styles you do play – you’re going to be leading a Little Walter Masterclass in Brighton – but are there any styles you don’t do? My core style is what one would call amplified Chicago blues. This mostly means Little Walter and Big Walter for diatonic playing and George Smith, if you’re talking about chromatic. I also love Jimmy Reed, Sonny Boy II & Slim Harpo for their acoustic stylings. I’m not really a “country” blues player or a Sonny Terry disciple, but I’d love to master that style someday. I don’t overblow or overdraw. I genuinely tried chasing overblows a few years ago but it quickly became a chore to adjust the reeds in my harps and my technique to accommodate the extra notes. I suppose I’m just lazy! In general, anybody that’s musical and soulful, regardless of genre. In the blues world, my contemporary harp heroes include the usual suspects – Kim Wilson, Rick Estrin, Mark Hummel, Gary Smith, William Clarke, Gary Primich, Paul DeLay. Amongst the really modern players, I admire Dennis Gruenling very much. What are your current projects and future plans? I’m excited about releasing my first album which I just recently recorded at Kid Andersen’s “Greaseland” studios in Campbell. That project will be my focus for the next couple of months. 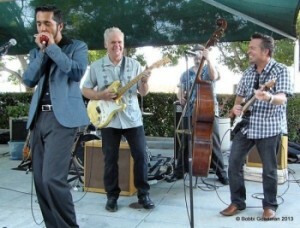 Once it’s out, I will likely do a couple of short West Coast tours with my 4-piece blues band. And who knows what else after that! And just how cool is the West Coast scene? It’s seems as far away as the Emerald City to folks in Europe! Walking with my baby down by the San Francisco bay..
Monty had fallen asleep beside an empty bag of pork scratchings. The scones had all gone and, except for a slice of cucumber and a soggy sprig of mint, the Pimm’s was down to an empty jug. Ah well, time for a round of Harvey’s Best and some Cheese’n’Onion crisps. The Doc stroked Monty’s ear and pondered another dose of West Coast blues. See you soon in San Jose!